As rescue workers attempt to bring much-needed supplies and medical assistance to the areas most affected by a super typhoon that ravaged the central Philippines, authorities have announced that more than 10,000 people may have lost their lives. The category-5 storm, named Haiyan internationally and Yolanda in the Philippines, made landfall on Friday with winds gusting to 195 mph (313 kph) – the strongest in the world this year and quite possibly the strongest tropical cyclone to make landfall in recorded history. In the city of Tacloban, the capital of Leyte Island, corpses lined the streets and survivors scavenged for food and clean water. Wounded residents filled the hallways of the only hospital not destroyed in Haiyan’s wake, with overwhelmed medical personnel unable to admit additional patients. Police and soldiers were deployed to stop looters who were reportedly turning to violence in their desperation to find rice and milk. Electricity and communications networks remain down on the three central islands of Samar, Leyte and Bohol. Approximately one million people have fled their homes and taken refuge in disaster shelters, spread out across 29 provinces. 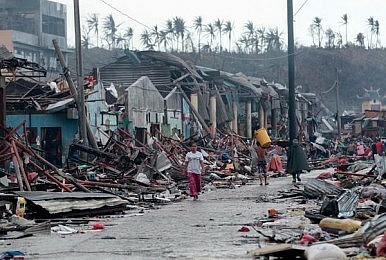 The Philippine government said that 12 million remain at risk. With waves that surged as high as six meters (20 feet), flooding and washed away infrastructure have constricted the flow of relief efforts. Philippine president Benigno Aquino III said that a “breakdown” at the local government level was hampering the delivery of necessary supplies. U.S. President Barack Obama expressed his condolences and pledged his government’s assistance. Secretary of Defense, Chuck Hagel, has deployed military aid from the U.S. Pacific Command. The European Commission has offered $4 million toward relief efforts. British Prime Minister David Cameron signed off on an emergency support package worth $9.6 million. Haiyan, which has been downgraded to a severe tropical storm, also caused the evacuation of 600,000 in Vietnam’s coastal regions. Residents of Hanoi, Vietnam’s capital, reported empty shelves at local supermarkets as people brace for the worst. Chinese authorities issued warnings for Hainan Island, Guangdong and Guangxi after the storm changed direction. About 13,000 people were preemptively evacuated from the tourist resort of Sanya. The storm is expected to make landfall in China around 7:00 pm.